It seems eerily fitting that Terrence Malick’s To the Wonder would be the final film reviewed by the auteur’s longtime champion, Roger Ebert. It is rather more surreal to think Olga Kurylenko commenced production on Malick’s latest in 2010, the same year she worked on the forthcoming but already infamous mermaid potboiler Empires of the Deep. Yet, any new film from Malick is a cinematic event in its own right. 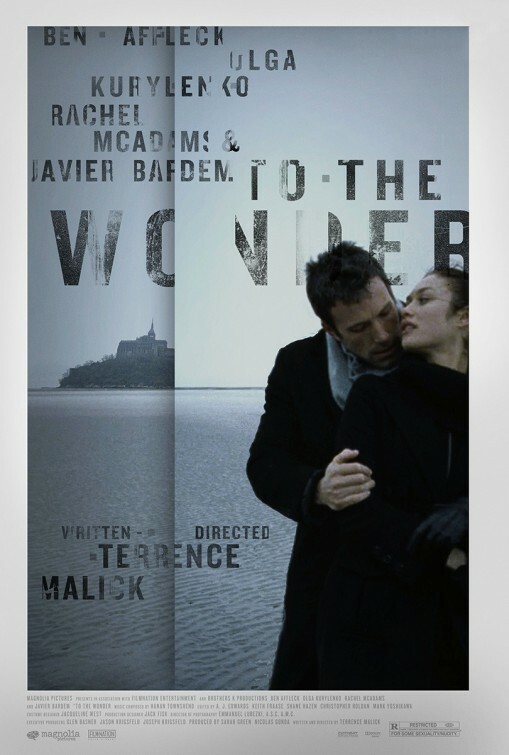 The director’s admirers will find it is very much a Malickian statement, except perhaps more so, when To the Wonder (trailer here) opens tomorrow in New York. Neil and Marina meet in France and fall deeply in love. He is a visiting American. She is a Ukrainian single mother. Intending to start a new life together, she and her daughter Tatiana move into his Oklahoma home, where the wind comes sweeping down the plain. Their dreamy ardor persists for a while, but soon fissures develop in their relationship. Eventually, Marina and Tatiana return to Europe. She and Neil eventually feel compelled to make another try, but this time her daughter stays with her (unseen) father. Despite the support of the equally alienated Father Quintana, the couple’s issues persist. Just under two hours, Wonder is practically a short subject by Malick’s standards. However, he makes absolutely no stylistic concessions. Frankly, it is more like a series of tableaux than a movie, even of the art house variety. Framing lovely images is a hallmark of Malick’s work, so his striking vistas should come as no surprise. Yet, at some point, moving pictures really ought to, you know, move. Throughout Wonder, Malick’s favored perspective on Ben Affleck’s Neil is the back of his head, which is obviously deliberately distancing. Yet, in a way it suits the reserved and reticent Oklahoman. Even as Malick and his characters seemingly strain to shut viewers out, cracks of profundity occasionally open up in the film. In one particularly heavy moment, Father Quintana counsels Neil it is always difficult to be the one who loves less than their partner. Indeed, Neil has plenty of guilt to process without the consolation of Marina’s emotional reveries. There’s something for the daytime talk shows to chew on. Naturally, Father Quintana has lost (or at least misplaced) his faith. Nonetheless, it is a deeply sympathetic portrait of a man of the cloth. Malick unflinchingly captures his loneliness and the imperfect solace he finds in service to others. Javier Bardem might not dig into such deep and dark places as he did for Biutiful, but he still conveys a sense of a man with a long, complicated history. Since nobody is really granted a substantial backstory, it is incumbent on the cast to evoke the sense their pains and regrets are rooted in something real and universal. That is a real strength for Bardem. Whereas Affleck is supposed to be cold and aloof, Olga Kurylenko is also surprisingly effective and affecting as the passionately needy Marina. Viewers who lose patience with Wonder are not shallow philistines. Malick de-emphasizes plot and character development in favor of imagery and in-the-moment impressionism. It is slow and at time pretentious. Yet, at the fleeting junctures where it all comes together, it is like the epiphany produced by an audacious free jazz performance. Dashed demanding, To the Wonder is mostly recommended for hardy Malick followers when it opens tomorrow (4/12) in New York at the Walter Reade Theater uptown and the Landmark Sunshine downtown.